Cupcake, my love: Graduation Cupcakes!! 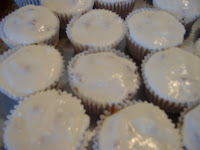 So, tomorrow is graduation day and I decided that I was going to my cupcakes for my party...I know, I know, finally some cupcakes on the blog that's titled Cupcake, my love! So when trying to decide what exactly to make I kinda struggled. I wanted to have something for everybody, but also wanted the flavors that I like, since it is my party and I can cry if I want to! So, after about 3 hours of debating I finally decided on cupcake #1 a chocolate cupcake with peanut butter filling and chocolate ganache, cupcake #2 was a caramel apple cupcake with caramel filling and vanilla buttercream and cupcake #3 was a vanilla cupcake with raspberry filling and raspberry/vanilla buttercream. I had a really fun time making all of these cupcakes, even though it took me all day, there's still something I find so relaxing about baking. 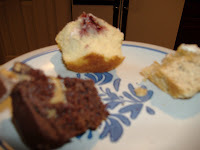 Each of the cupcakes turned out really good, and are tasty in their own special ways. 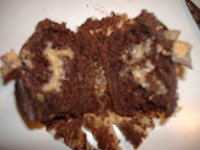 For the chocolate cupcake, I really liked the peanut butter filling that I made (which was the filling found on the Culinary Concoctions Blog). I had to tell myself to quit eating it outta the mixing bowl (and you may be turning our nose up and saying "uh, eating out of the mixing bowl", but this simple guilty pleasure is something that we all do...whether you want to admit it or not!) 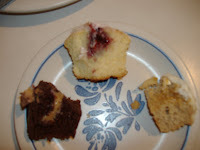 This was the first of the three cupcakes that I filled, and at first I started with the "cone method". but after a few cones, I switched to lethal injection with the pastry bag and tip. 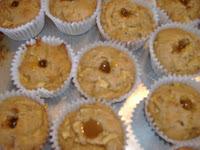 And I promise no cupcakes were hurt during this process! I just found the pastry bag to be much easier and quicker, but the cone method allows you to put more filling in, so now do I go for efficiency or quantity of filling? Tough choice! 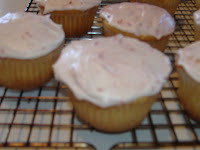 I also loved the raspberry cupcake, it was so lite and refreshing, but I wish I had put more frosting on them, cuz I love frosting :0) At first bite it was like biting into a fluffy cloud. The texture of this cake was amazing! It was smooth and moist, very delectable. Overall I was very pleased with all of my creations, but we'll see how good they really are when they are put to the test at my party. Hi! 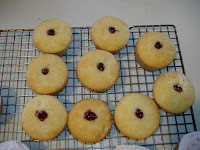 Your cupcakes look yummy! I'm sure they were a success at your graduation party! Oh yeah, WELCOME to blogging :)!